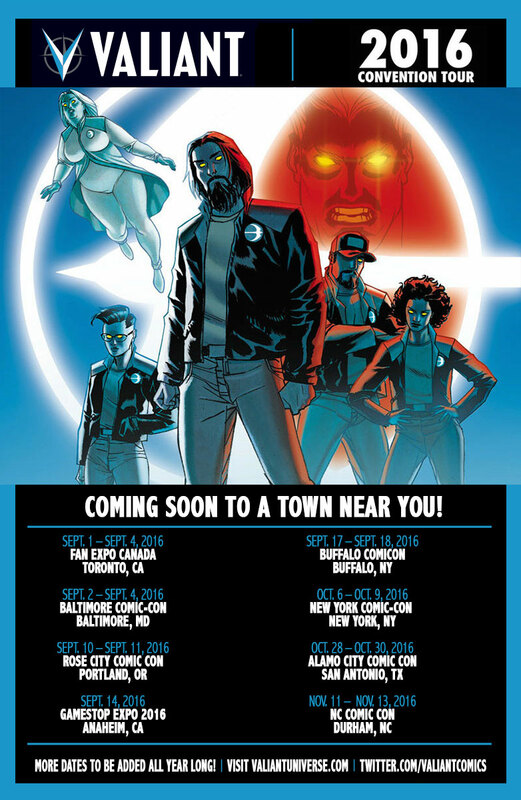 Valiant Debuts at GameStop Expo 2016 with Collections, Merchandise, and More! For one day only, the most acclaimed publisher in comics is invading the biggest video game conference of the year! On Wednesday, September 14th, Valiant Entertainment will be making its debut appearance at GameStop Expo 2016 — the premier fan experience for gamers and pop culture enthusiasts alike — for an action-packed event filled with can’t-miss merchandise, award-winning trade paperbacks and hardcovers, and more! All day long, join Valiant inside California’s Anaheim Convention Center at Booth CL and find out why Valiant is one of the most beloved superhero universes in all of entertainment with a mountain of trade paperbacks, deluxe hardcovers, and exclusive t-shirts and merchandise for critically acclaimed and award-winning titles including BLOODSHOT REBORN, BOOK OF DEATH, DIVINITY, FAITH, NINJAK, THE VALIANT, WRATH OF THE ETERNAL WARRIOR, X-O MANOWAR, and many more! We’ll see you in the heart of Orange County! And don’t miss a moment of the action as Valiant’s one-of-a-kind convention road show storms on through Anaheim; Buffalo; New York City; San Antonio, and more all summer long! For more information, visit Valiant on Facebook, Twitter, Tumblr, Instagram, and ValiantUniverse.com.